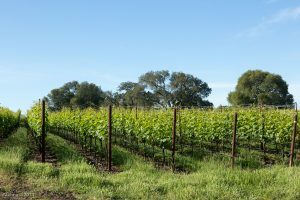 (Sun Chase) – The 2016 growing season was early, even and all-around excellent. A warm, dry spring brought early bud break, helped with canopy vigor and berry size, and created ideal conditions for flowering and fruit set under sunny skies. Our grapes were gently whole-cluster pressed for over four hours (Press cycle used in Champagne). Only 10% of the wine was allowed to go through malolactic fermentation in order to preserve the brightness of the wine and gain just enough roundness on the palate. TASTING NOTES: Notes of citrus, lemon, crushed rocks and white flowers. It’s medium-bodied,fresh and clean, albeit in a slightly mid-weight, yet charming style. I like its purity and elegance.